HARARE, Jun 9 2013 (IPS) - For 61-year-old Sarah Chikwanha from water-starved Chitungwiza, a town about 25 kilometres outside Harare, Zimbabwe, there is no choice. She must buy her water from illegal water traders, whose businesses have sprung up across the country. “We only have water once weekly in Chitungwiza, and so I have no choice but to buy from dealers at 95 dollars for a 2,500-litre tank,” Chikwanha told IPS. These new, illegal businesses are the result of the dire need for water, as rationing in towns and cities continues because of shortages of water treatment chemicals in this southern African nation. Harare’s mayor, Muchadeyi Masunda, has gone on record saying that the council needs three million dollars a month for water treatment chemicals, a challenge compounded by the city’s obligation to supply water to neighbouring towns like Chitungwiza, Norton, and Ruwa. 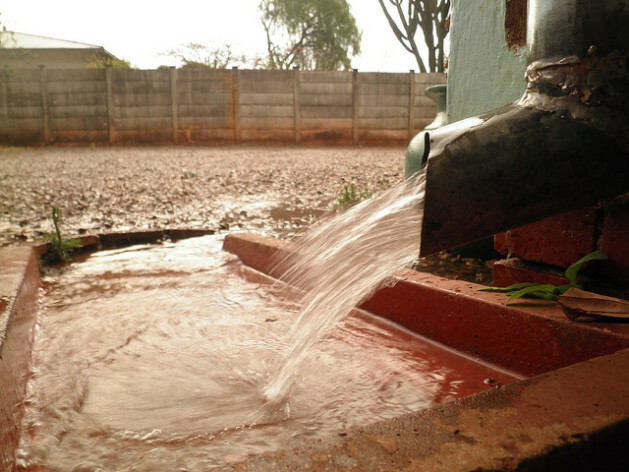 Statistics from the Harare Residents Trust (HRT), an advocacy group, indicate that only 192,000 households in Harare are connected to the water system, while the rest depend on boreholes or rainwater. Harare needs 1,300 megalitres of water daily, but the current supply ranges from 600 to 700 megalitres. Councillors from Chitungwiza, where Chikwanha lives, told IPS that the council there failed to pay for water supplied by Harare’s Lake Chivero, thus intensifying water rationing in a town of nearly two million people. People have now turned to wells, streams and inadequate boreholes, as well as illegal traders, for their water. “Water shortages have been going on for over a decade now, dating back to the beginning of Zimbabwe’s economic crisis around 2000, when revenue collection dwindled after commercial farmers who used to contribute faithfully to paying water bills were evicted from their farms,” a top council official in Harare told IPS on condition of anonymity. Panganayi Charumbira, a councillor from Harare’s Budiriro low-income suburb, told IPS that both Zimbabwe’s urban and rural areas were affected. “The water crisis is getting worse in towns, but it’s even worse in the countryside,” Charumbira said. But the water traders say that despite the worsening water woes, they find it hard for their operations to be regularised. “We sell water illegally here because council authorities are not willing to licence us, accusing us of trading in contaminated water,” Delisono Jamela, a water trader in Harare who runs an unregistered water-selling company called Jame-Waters, told IPS. Donemore Siwela, who runs Sycamore-Oasis, another unregistered water-selling company, acknowledged that he pilfers tap water from strategic places that are not experiencing water rationing. “My company is well connected to hospitals and politically-influential authorities here housed at government buildings, from which I draw water. Nothing happens to me even if I’m caught,” Siwela told IPS. But according to Zimbabwe’s Water Bill of 1998, a licence to use water is issued by a responsible local authority, to which a prospective user must apply. The Standards Association of Zimbabwe (SAZ) in November 2012 intensified the monitoring of water-selling companies amid revelations that other water dealers were not meeting required standards, according to SAZ director general Eve Gadzikwa. “We engaged the regulator, who in this case is the Food Standards Advisory Board (FSAB), for updates on water quality,” Gadzikwa told IPS. FSAB is the regulatory board tasked with making random checks on the quality and safety of water for domestic and commercial use in Zimbabwe. Harare City Council spokesperson Lesley Gwindi accused water traders of jeopardising public health. “Water traders are fuelling the spread of waterborne diseases by selling untreated water, and as council, we are doing everything within our capacity to ensure that everyone gets a fair share of clean water,” Gwindi told IPS. However, Dr. Portia Manangazira, director of the Ministry of Health and Child Welfare’s Department of Epidemiology and Disease Control, told IPS that cases of waterborne diseases were isolated nationwide. “Cases of waterborne diseases like typhoid and diarrhoea are, for now, isolated here,” Manangazira said. But more than 4,200 Zimbabweans succumbed to cholera from August 2008 to mid 2009 as contaminated water supplies spread the disease amid the country’s failing health care systems. Some dealers told IPS that they sourced water from local lakes like Lake Chivero, and they claimed they purified it on their own before selling it to water-starved residents. “We draw water to sell straight from Lake Chivero, normally at night because we are deemed water poachers by council cops here,” a water dealer said. Harare’s urbanites like 46-year-old Tracey Mangena, a single mother of five, find the water and tanks purchased from dealers unaffordable. “The tanks cost 750 dollars each before filling them with 2,500 litres of water at 95 dollars, and for me, I can’t afford it as I’m jobless,” she told IPS. Many other urban dwellers here, dogged by the water crisis, have drilled their own boreholes. And others, like 56-year-old widow Miriam Saungweme from Harare’s Mufakose low-income suburb, have dug unprotected wells. “Poor people like me have had no choice in the face of mounting water woes except to dig wells from which to draw water,” she told IPS. Meanwhile, the Rooftop Rainwater Harvest, a project established in 2009 by International Relief and Development, a non-governmental organisation, in partnership with the United States Agency for International Development to assist underprivileged people with clean and safe water, has been a source of relief to many during the rainy seasons. “We enjoy a temporary reprieve from water woes with the help of this rooftop water-harvesting initiative, but with the rainy season over, several of us here have since fallen back to a water crisis, and we are scavenging for the precious liquid from unprotected sources or buying from dealers at four dollars per 20-litre container,” 34-year-old Agnes Mhasi from Harare told IPS.